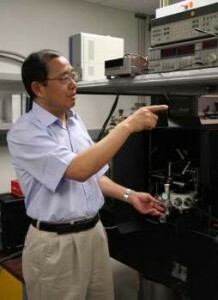 Cun-Zheng Ning in his nanophotonics laboratory at ASU. We could soon see the potential of laser technology expand dramatically. Ways to make lasers smaller are being discovered through collaborative efforts of researchers at Arizona State University and Technical University of Eindhoven in the Netherlands. The work opens up possibilities for using nanoscale lasers to significantly improve the performance of computers and speed up Internet access . The teams’ advances in breaking through previous limitations on how small lasers can be made are reported in a recent edition of the online science and engineering journal Optics Express. 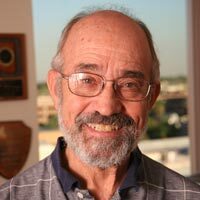 Authors of the report include professor Martin Hill, who leads the Eindhoven team, and ASU team leader Cun-Zheng Ning, a professor in the School of Electrical, Computer and Energy Engineering in ASU’s Ira A. Fulton Schools of Engineering. Lasers once were the stuff largely of science fiction. Today they are everywhere in the world of electronics. They are essential components of CD and DVD players. They are used in the automatic check-out stations in supermarkets. Small lasers are used in technology that enables communications across continents, and soon nanolasers will be used for communications between the parts inside your computer. Engineers have been trying to make lasers smaller because it would enable the devices to be more effectively integrated with small electronics components. The more lasers that can be used with these components, the faster electronic devices could perform. This would do things such as speed up the workings of your computer and Internet access. The size of lasers in any one dimension (for example, thickness) has been thought to be limited to one-half of the wavelength involved. For instance, for lasers used in optical communications the required wavelength is about 1,500 nanometers, so a 750-nanometer laser was thought to be the smallest a laser could be made for optical communications. In an optically denser medium such as a semiconductor, this limit is reduced by a factor of the index of refraction (expressed mathematically as ~3.0) of a semiconductor – in this case to about 250 nanometers. The limit is sometimes called the diffraction limit, a property associated with any wave, such as a beam of light. Current theory says you can’t make a laser smaller than this diffraction limit – or smaller than 250 nanometers for a semiconductor laser for communications devices. The research teams at ASU and Eindhoven are showing there are ways around this supposed limit, Ning says. One way is by the use of a combination of semiconductors and metals such as gold and silver. Ning and Hill have achieved something like that by using a “metal-semiconductor-metal sandwich structure,” in which the semiconductor is as thin as 80 nanometers and is sandwiched between 20-nanometer dielectric layers before putting metal layers on each side. They have demonstrated that such a semiconductor/dielectric layer, thinner than the diffraction limit, and squeezed between metal layers, can actually emit laser light – a laser with the smallest thickness of any ever produced. The structure, however, has worked only in a low-temperature operating environment. The next step is to achieve the same laser light emission at room temperature. Researchers worldwide are interested in integrating such metallic structures with semiconductors to produce smaller nanolasers because of the promise of applications for smaller lasers in a wide range of technologies. Nanoscale lasers can also be integrated with other biomedical diagnostic tools, making them work faster and more efficiently, he says. These advances also represent a major step in nanophotonics – the study of the behavior of light on the nanometer scale and the ability to fabricate devices in nanoscale. “Nanolasers can be used for many applications, but the most exciting possibilities are for communications on a central processing unit (CPU) of a computer chip,” Ning says. As computers get faster, the communication between different parts in a computer creates a processing bottleneck, he explains. Since a signal can be transmitted between computer components much faster by a light wave emitted by a laser than by metal wires, optical communication (communication using light) is “the ultimate solution for improving on semiconductor chip communications,” Ning says. Research in this field in the United States is being funded by the Defense Advanced Research Projects Agency (DARPA), the central research and development organization for the U.S. Department of Defense. 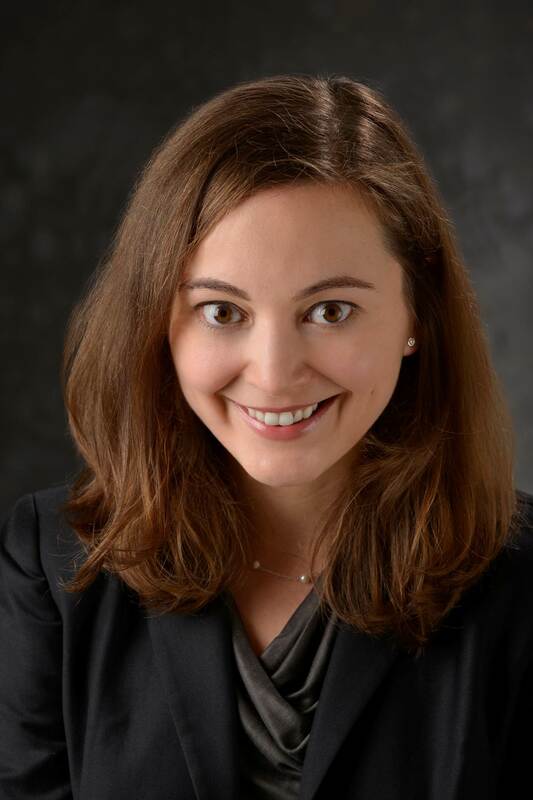 The agency is supporting a collaborative team partnering researchers at ASU, the University of California at Berkeley and the University of Illinois, Urbana-Champaign. ASU’s collaboration with Hill’s team at Eindhoven happened by coincidence, Ning says.